The Springfield Trapdoor served as the United States Army’s “warhorse” for at least 20 years. It was held by both sides through the Indian campaigns in the American West and widely used by American troops during the Spanish-American War. The powerful single shot Trapdoor was also quite popular with many famous Indian warriors. Sitting Bull was carrying a Trapdoor Carbine model when he surrendered to American troops at Fort Buford, North Dakota and Geronimo was carrying the same when he was captured by General Miles in Skeleton Canyon, Arizona in 1886. In the world of weapons and artillery, the Springfield holds the dubious honor of having been carried into the Battle of Little Bighorn by General George A. Custer’s 7th Cavalry on June 25, 1876. While repeating rifles such as the Spencer and Winchester were already available, the U.S. Army chose the Springfield carbine, a single-shot weapon (shorter and more suitable for the cavalry than the rifle) that had to be reloaded after each fired round. Many officers believed it to be superior because of its considerable accuracy at long ranges. The Springfield Trapdoor came about in 1873, as a redesign of the Army’s Allin Trapdoor rifle. The Springfield was made to hold the new, more powerful .45-70 military cartridge. The .45-caliber cartridge came out of the muzzle at 1,200 feet per second and could make significant hits up to 600 yards. Full-stocked, 32″ barreled rifles as well as half-stocked, short-barreled carbines were produced for the military. 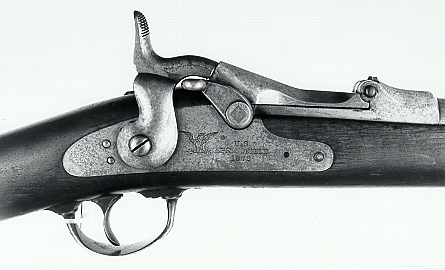 The Wheaton College Archives houses two of these vintage Springfield rifles. They were discovered among articles in Wheaton’s archival collections. With no provenance to speak of, historians can only speculate what dangers of the early Illinois frontier were kept at bay by this intimidating weapon.